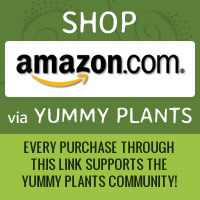 Here’s an easy vegan recipe with some south Indian spice. Thanks to Mrs. R. for sharing her sambar recipe! Pair with a dosa and chutney for a super yummy south Indian meal! Note: You may find toor dal in a regular supermarket near the rice and beans. If you don’t live near an Indian store, you can buy sambar powder online. 1. Make the dal paste. Cook ½ cup toor dal with 4 cups of water. Cook for approximately 45 minutes until the lentils have completely disintegrated and much of the water has boiled away. It should be a thick paste. (See inset photo of the sambar paste with the veggies). 2. Make the sambar “soup.” Heat the oil in a pan. To the hot oil, add the mustard seeds and cumin seeds. Once the mustard seeds have split and the cumin seeds turn brown, add the onions, veggies and cilantro. Add the salt, sambar powder, chili powder, and turn the heat to low. 3. 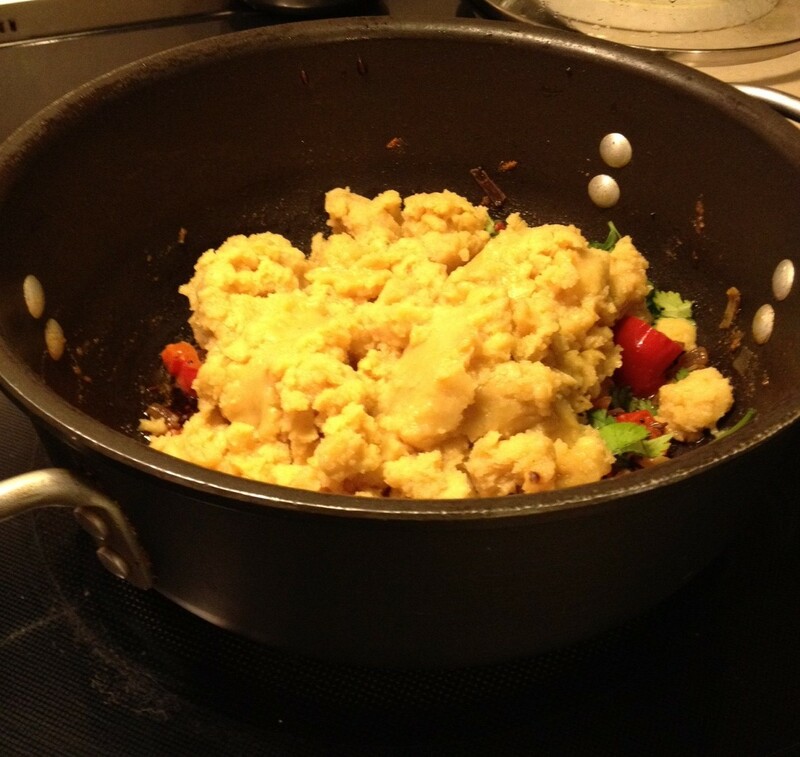 Add enough water to barely cover the vegetables, cover the pan with a lid, and simmer until the vegetables are cooked. 4. Add the cooked dal paste to the vegetable soup. Add a small amounts of water to incorporate the dal paste. The mixture should be thin, but not watery. If you add too much water, you can boil it out. Add tamarind paste (or lime juice) and simmer for 3-5 minutes. 5. Serve with the dosa and chutney. Conserve remainder in the fridge. It will keep 3-5 days. You can also freeze the leftover sambar for later use. 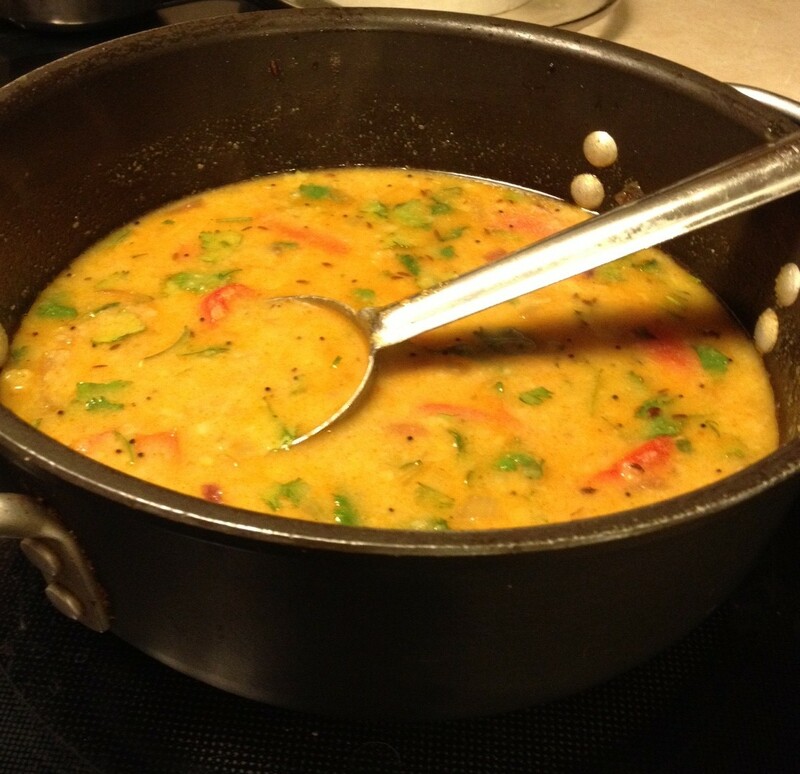 Let us know what you think of this easy vegan recipe: Sambar!